the wwii era is just so nifty! 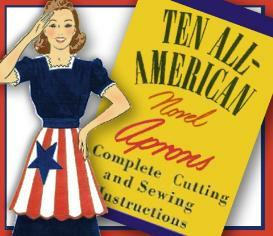 originally published by the "white sewing company"
"old glory" ~ it's the covergirl's apron! in the colors & style of our flag~with a star pocket! "southern belle" ~peach organdy with lots of black bows that scarlett would have loved! "westward ho!" ~ yippie-i-oh-ky-a! complete with stars bars & cuffs! "pan american" ~ pretty apron honoring the colors of our southern neighbors! "knickers" ~ this "proper" apron's front is laced up w/ "gored" skirt white collar & black windsor tie! "gingham girl" ~it's the girl-next-door! sweet gingham ruffles & rick-rack! 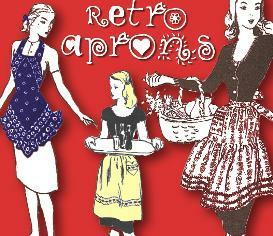 "hollywood" ~what is more american-glam then a ruby-red-lipped heart apron with plenty of style?! excellent directions for each apron! 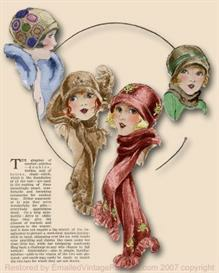 wonderful instructions* for making the apron patterns from smaller grids to the larger actual patterns! i've included a printable grid to make it super easy to transfer the drawing. 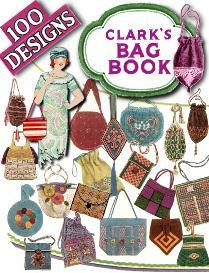 ~buy any 2 patterns get 3rd your choice free!! ...don't buy your 3rd item just email me your choice and i will add it for free! although this pattern is in the public domain i am selling my copyrighted restored version - reproduction for re-sale is strictly forbidden!